Irish Post-Impressionist Artist: Biography, Paintings. William Leech was an Irish painter and illustrator whose works featured a wide range of outdoor and indoor subjects, including coastal and harbour scenes, landscapes, interiors, still life and portraits. Leech is noted as a strong colourist and was influenced by both the Impressionists (such as Monet and Cezanne), and Post-Impressionist painters (like Matisse and Van Gogh). Born in Dublin, William John Leech absorbed drawing and fine art painting at the Dublin Metropolitan School of Art before transferring to the Royal Hibernian Academy where he studied under the Irish Impressionist landscape painter Walter Osborne. In 1903, he left Dublin to paint in Paris and became inspired by the French countryside. Later that year, Leech visited the small Breton village of Concarneau (a latter day Barbizon landscape school) and painted there on and off until 1917. He became noted for his illustrations of its harbour. In fact, Concarneau had become something of an artist's colony, attracting among others Aloysius O'Kelly and John Lavery, both of whom became Leech's friends and influenced his paintings. Curiously, not unlike Osborne's paintings, Leech's early French pictures were completed in darker colours. It took a little time for him to develop the bright rich colour palette which became his hallmark. 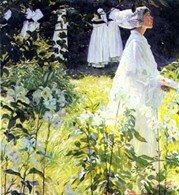 However, as his plein-air painting developed, he rapidly developed an appreciation of sunlight and deep shadow. Leech also shared much in common with fellow artist Roderic O'Conor. Both men studied in Paris and in the villages of Brittany, both painted interiors, demonstrating an interest in indoor and reflected light. Above all, both men shared a passion for colour. During their time in Brittany, they studied and absorbed the methods of Impressionism, and their paintings show signs of Van Gogh and Matisse. In Leech's case, however, other more conservative influences were at work including those of William Orpen and Norman Garstin, and his later English paintings are similar to works by contemporary British painters, such as Gerald Kelly and William Nicholson. In Leech's landscape painting the Railway Embankment (c. 1938), the scene is devoid of people, animals, and train, yet the impression of movement and speed is vividly conveyed. The railway track, which runs diagonally across the composition, establishes a strong perspective which is reinforced by the parallel lines of the telegraph wires receding into the distance. In contrast, the rambling fence on the left of the track takes its course from the lie of the land, thus lending the scene a traditional rustic dimension. See also how the sunlight softens the dark imagery of the artificial rail-road which carves its irresistible way through the countryside. In addition to his trips to Brittany, Leech travelled throughout Europe and eventually settled in England. He died in 1968 at the age of 87. 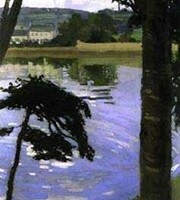 His works are represented in all major collections of Irish painting. The auction record for a work by William John Leech was set in 1998, when his oil painting, entitled The Blue Shop, Quimper, was sold at Christie's, in London, for £265,500.  For details of other plein-air painters, see: Irish Artists: Paintings and Biographies.  For more about Post-Impressionist artists like William John Leech, see: Irish Art Guide.